Relyum platform can be used to secure field-bus traffic in critical systems. As an example, Relyum offers an innovative solution to face the new security challenges emerging in the context of IEC 61850 Smart Grids and substations. In this standard, there are defined some of the most stringent real-time messages for control available in the Industry (GOOSE and SMV messages). 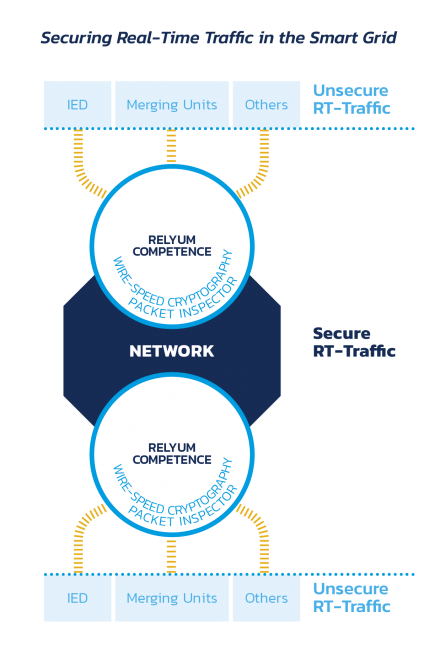 Indeed, there is a specific standard developed to define how they could be secured (IEC 62351-6) and how the key exchange could be addressed (IEC 62351-9).The Technology beyond Connect embedded on Relyum offers a suitable solution to secure this traffic. RELY-RB Time-aware Redbox Switch with IEC 62351-6 includes FPGA based wire-speed cryptography to cipher, decipher and authenticate real-time traffic with low latency. It includes security features at different layers implementing defence, detection and reaction capabilities. It integrates specialized security chip to provide unique device identification. This feature ensures a robust chain of trust valuable for IEC 62351-9 operation. In addition, other embedded ICs allow physical security monitoring like real-time power consumption analysis or equipment manipulation. For detection and analysis purposes, RELY-RB supports customizable internal port mirroring capability linked to an embedded SIEM agent.